Starting January 1, 2014 Everyone must have health insurance. Everyone must have health insurance. 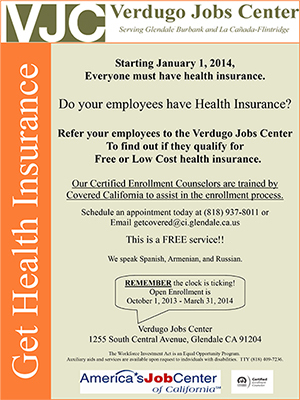 The Verdugo Jobs Center (VJC), an agency of the City of Glendale, has partnered with Covered California™, the State insurance marketplace, to be a community resource for consumers who will enroll in health plans to comply with the Affordable Care Act. As a Certified Enrollment Entity, we educate consumers on healthcare options and guide them in the enrollment process. Equipped with formally trained Certified Enrollment Counselors, we provide no-cost, in-person assistance to individuals and families about their health plan options and qualifying for financial assistance. This is a FREE service!! !